We all know that asking for money ranks right up there with public speaking. Nearly all of us fear it, and yet it is critical to our success. This book will help embolden you to ask with skill, finesse, and powerful results. 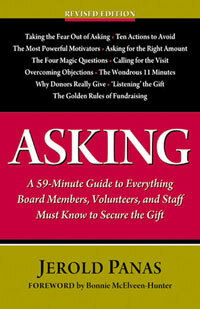 Author Jerold Panas, who as a staff person, board member, and volunteer has secured gifts ranging from $50 to $50 million, understands the art of asking perhaps better than anyone in America. 1. The Joy of Asking!